USR - JS Levezou 3-1. 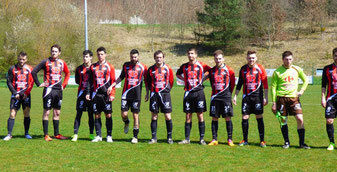 Camboulazet - USR II 2-1. Réception de JS Lévézou au programme pour les rouge et noir ce samedi, et belle victoire 3 buts à 1 de bonne augure en vue du sprint final. Défaite de la réserve 2-1 sur la pelouse de Camboulazet qui dit adieu à ses espoirs de montée, but de Emmanuel Vergnes. Hi! Someone in my Facebook group shared this site with us so I came to check it out. I'm definitely loving the information. I'm bookmarking and will be tweeting this to my followers! Excellent blog and amazing design. Hi, I do believe this is an excellent web site. I stumbledupon it ;) I am going to revisit once again since I book-marked it. Money and freedom is the best way to change, may you be rich and continue to guide others. Great site you have here but I was curious if you knew of any discussion boards that cover the same topics discussed here? I'd really like to be a part of community where I can get feed-back from other knowledgeable individuals that share the same interest. If you have any suggestions, please let me know. Thank you! Hello! I've been following your website for a long time now and finally got the courage to go ahead and give you a shout out from New Caney Texas! Just wanted to mention keep up the good work!